Okay, so you’ve started on your Network Marketing Business. You’ve been out prospecting and sharing your opportunity. You’ve taken them to an online presentation, gave them a tool your company uses, brought them to an in home party or a weekly briefing. Now what? The Top 5% have mastered this skill. It’s called Follow Up! I personally tell people that I’d rather you have a smaller amount of people to follow up with then a large number of people and you don’t follow up with anyone. You want to be a Business Builder that is known for keeping their word and when you say you are going to follow up, then follow up! If you have a good follow up system in the beginning, then inevitably you will have no problem putting more people in your follow up funnel. 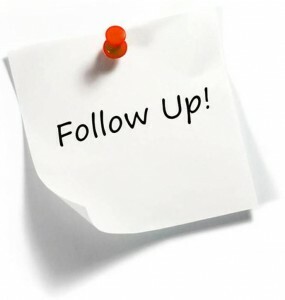 Now, there are different types of follow up systems. For all of you Internet Marketers and those in Network Marketing, you might be using something like Aweber or Get Response to help with your follow up and drip campaigns. 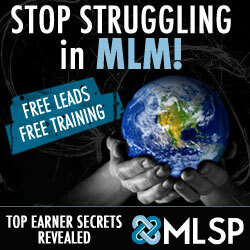 One of my favorite Internet Marketing training programs, follow up campaigns and lead generation sources is also MLSP. MLSP- My Lead System Pro has it all, so make sure to look at it if you are serious about building an Internet Marketing business. However, you still need a solid follow up system after you’ve built trust, and they like you and now want to purchase your service or product. I hope this helps! If you have any more questions about the $20 Follow Up System then give me a call.